(02-10-2019 10:58 AM)swagsurfer11 Wrote: Shouldn't they be suing CNN? I missed how Phillips defamed Sandmann. I'm pretty sure that Phillips lied on TV about what happened at the event, blaming the Catholic kids for instigating things, which didn't happen. Phillips on the other hand did appear that he was trying to instigate something himself when he walked right up to Sandmann, got in his face chanting, and was constantly beating his tom-tom right next to Sandmann's head. It was an aggressive and bullying type of act. Not saying that is why he would be sued. Just pointing out his hypocrisy. Lost in all of this is the Black activist group that was shouting hateful, racist, and sexual epithets at the Covington Catholic boys - who were just standing there peacefully waiting for a bus, and pretty much no one is making a big deal about that. I just don't see where Sandmann is going to be able to claim damages from Phillips. They both have there version of how it happened and if you interview 100 people that were there you'll probably get a 100 different versions. Now there might be a case against CNN (or other news outlets), I just don't see the benefit of going after Philips. He said the boys “surrounded him” and that he felt threatened. Further, it was staged by he and his “videographers”. One is clearly heard saying “ Ok, we got what we wanted”, or ok we got plenty, something along those lines. He was clearly trying to provoke them, so he once again took “ point”. That and he’s a lying dicktard, these are KIDS. Messy his life up a bit, maybe next time he sees the error of his ways. And Phillips has done similarly a few years back at a university in Michigan. (02-10-2019 03:52 AM)DavidSt Wrote: The case well be thrown out of court because the punk kid was smirking thinking it was funny. So smirking is against the law? Don't you know ...... anything that goes against the warped Liberal mindset SHOULD be against the law if it isn't already. How dare that kid just stand there and smirk while the strange creepy guy has walked up and gotten right in his face chanting and banging a tom-tom in his ear. Damn it ... we want some kind of violent reaction when we provoke you like that. Something that we can post on the news showing how violent those deranged, racist, MAGA hat people are. LOL. I think you should be banned for spreading lies. Oh, and for being an idiot who doesn't comprehend what he see's even when it's right in his face. See, I choose to view it as the nervous reaction of a scared kid when confronted with a scary looking adult getting right in his face looking creepy. You appear to be OK with that though. To think I used to defend you. Tread lightly. I defended him, and then pointed out the brazen stupidity, and got banned for saying something along the lines of "I can't believe I defended you, and I won't make that mistake again". (02-10-2019 12:22 PM)mptnstr@44 Wrote: Sandman can sue for libel. Whether he wins would be up to a judge/jury. Key evidence would be the extended video and the interpretation by the judge/jury as to which party is telling the truth or if there is room for both parties' interpretations being the truth as they see it. Phillips has lied before and been caught in falsehoods. He also has a proven history as an instigator agitator. Guarantee both past lies and his past attempts to agitate will be presented as evidence towards his credibility. Phillips' group moved to stand between the kids and the black activists because the black activist group was about ready to do a smack down on the kids. Those black activist group was also hurling racists insults at Phillips' group as well. With the Native Americans and the kids came together? The bigger group would have scared the cowards off. 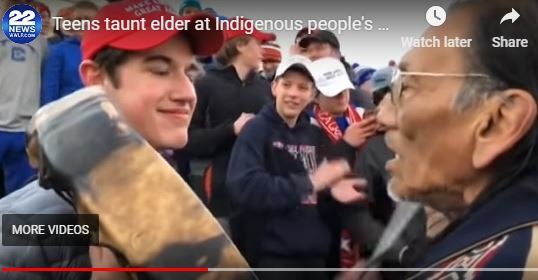 That kid's reaction should not have been a smirking because the kids joined in with the Natives drumming and chanting laughing at the cowards that were the black activists. That might be the Cartoon Network's version of things, but it isn't the reality of what actually went down. The non-economic causes of action in a defamation lawsuit is damage to an individual's reputation, personal humiliation and shame. Further causes of action in something like this would be mental anguish, emotional distress, anxiety, mental pain and suffering, etc. I imagine the plaintiff's lawyer would argue there is an economic component to this as well (he'd have to have a an expert to opine the kid's would have a loss of earning capacity as a result of this incident). All the players will be parties to this case, although you are partially right in saying that CNN/other media outlets would be collectible whereas Philips has no collateral source to pay a settlement/judgment. The Sandmann parents would then be counter-sued. Nothing's going to happen. (02-11-2019 02:26 PM)Ohio Poly Wrote: The Sandmann parents would then be counter-sued. Nothing's going to happen. People who do not litigate do not understand that cross-claims are filed in lawsuits all the time. A lawyer representing a party in a civil case for allegedly rear-ending someone will cross-claim the plaintiff caused the accident by suddenly stopping or backed into their client. The merits of the case will then be bourn out in discovery. If the case is tried, the jury will weigh all the testimony to find which is more probable. Good luck trying proving a case against Sandmann's family. You still havent answered the question. What actions would/could Sandman be sued for? All you say is that 'cross claims occur all the time'. Talk to Ohio Poly... he was the one who brought that up. IDK what theory his side has. I think you've missed out on reality for the past couple of weeks. They were in the process of attacking these four black individuals," Phillip said. "I was there and I was witnessing all of this ... As this kept on going on and escalating, it just got to a point where you do something or you walk away, you know? You see something that is wrong and you're faced with that choice of right or wrong. " There were many fine people on both sides. (02-11-2019 04:25 PM)swagsurfer11 Wrote: There were many fine people on both sides. Nice try. You failed though.